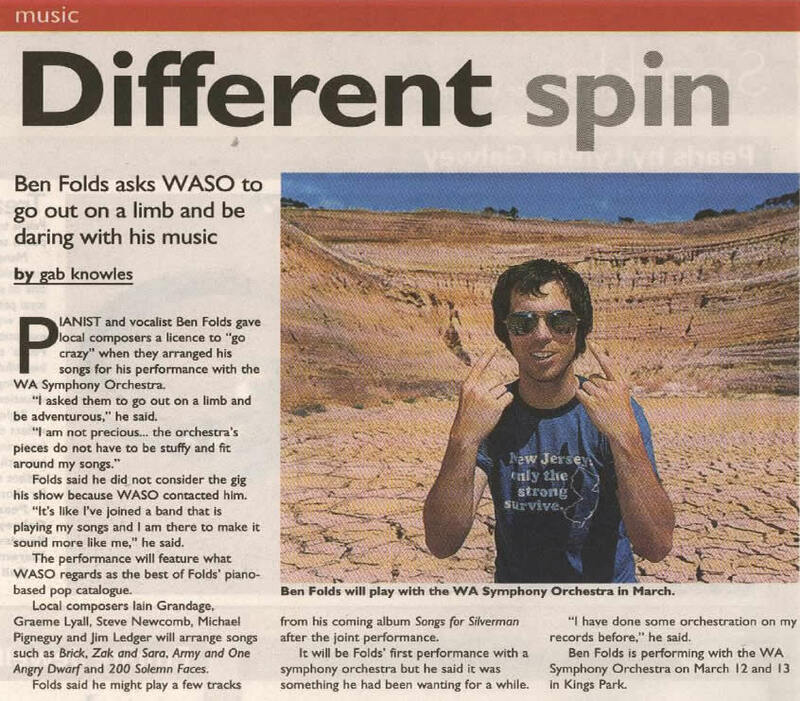 The upcoming gigs that Ben has with the Western Australian Symphony Orchestra (WASO) on March the 12th and 13th got a mention in Tuesday's edition of the Western Suburbs Weekly (a name I certainly approve of) - a local free paper delivered to residents of Perth. Anyway, Chris (former owner of the-bens.com) was kind enough to scan and send the article for us. "I am not precious... the orchestra's pieces do not have to be stuffy and fit around my songs." "It's like I've joined a band that is playing my songs and I am there to make it sound more like me"
They named a few songs that are being arranged: Brick, Zak and Sara, Army and One Angry Dwarf. Ben also mentioned he might play a few songs from the upcoming "Songs for Silverman" after the main set with the orchestra. Please please PLEASE can someone tape this? I don't know about you, but I've a feeling this is going to be something very special indeed. Many thanks to Chris for taking the time and trouble to hunt down that scanner!